I hope you come, because it’s going to be worth it. Crunchy. Soft. Sweet. Sour. Sweet. Intriguing. More please. 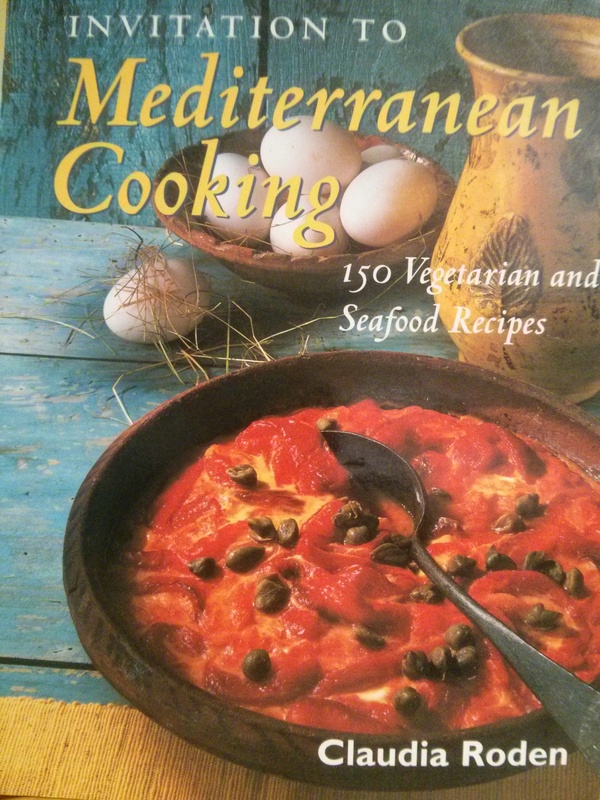 Lucky for me was the day sometime during the summer of 2009 when I happened to borrow Invitation to Mediterranean Cooking by Claudia Roden from the public library. I tried a few recipes from it at the time, and they were all good, but the one that stood out was Tomato Risotto. I’ve taken the book out several times since – let’s just say that mark on page 87, opposite the tomato risotto picture, may or may not have been caused be me (a food bookmark is what you want to see in a cookbook anyway, right??) – and I was looking forward to seeing the familiar pages again after I’d decided to make the recipe again last month. When I went to get the book from the library, though, someone else had taken it out! I also couldn’t find the photocopy I’d made of the recipe, which I wanted to see to double check the amounts. So, to the computer I went, and a small donation to the internet commerce fund later, I became the owner of my very own kitchen copy. Here’s how to get the party going. Heat the oil in a large frying pan, medium heat. Add the onion and garlic, and saute until partially softened, about 10 minutes. Simmer for about 40 minutes, or until the rice is mostly cooked (just a little crunchy), stirring occasionally. Add the salt, pepper, and sugar. I love writing three-word steps. The next step is to try not to eat too much of it before going to your picnic, potluck, or tailgate. I like it best either warm or at room temperature. If you think the recipe looks really easy – and it is – allow me to note the following also: the original recipe doesn’t include onions (I added them), and I doubled the recipe (why make less when you can make more). A few other small variations from the C.Roden original are the salt, pepper, and sugar quantities. I listed what I used this time, but as I’ve noted in the past, such as when making lyrical tomato sauce, how much to add is up to you. 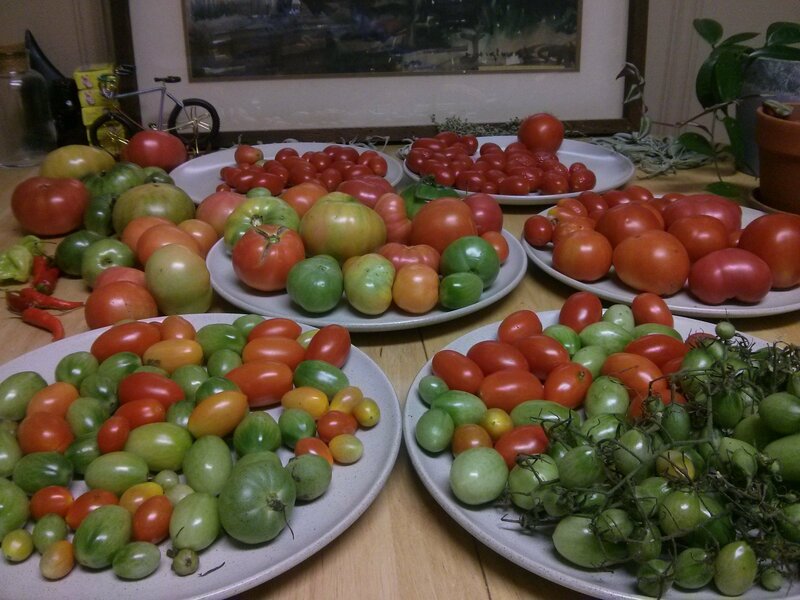 Yes, that’s how my table looked right before picking the 12 ripest tomatoes for the risotto. A table of the frost’s creation. 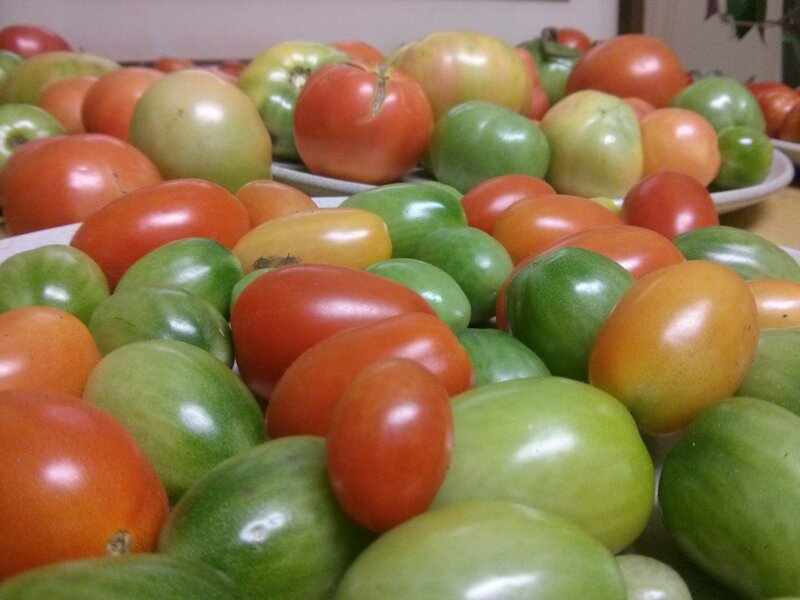 Yes, last weekend New Jersey had its first frost, which means a few things: I picked all the tomatoes from my community garden plot ahead of time (red and green), and farmers around the state, and in other states, picked their last tomatoes for the season too. 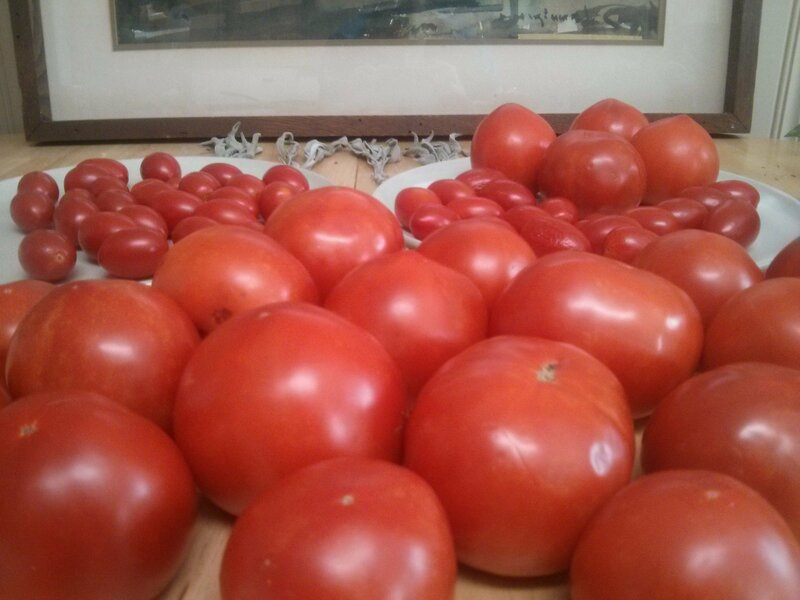 There were still some tomatoes at the farmers’ market when I went this week, though, and when I asked a farmer friend about it, he said you should be able to still get tomatoes at the market for a week or two. Which means, of course, tomato risotto! As in, it’s not too late. It’s there if you want it, a little summer wow to help bring in the fall. 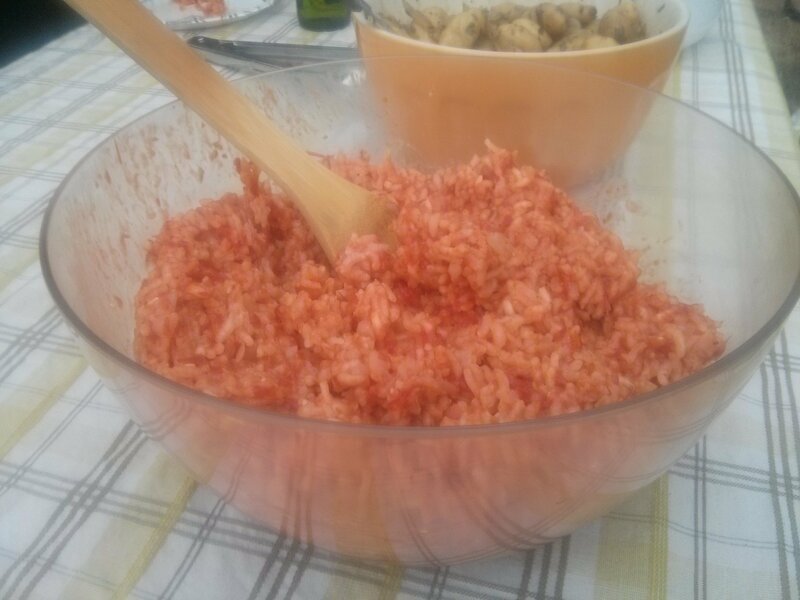 This entry was posted in Uncategorized and tagged food, potluck, recipe, risotto, summer, tomatoes, vegan, vegetarian on October 24, 2015 by dave379.